Over the past little while Microsoft has been rolling out information about its next line of products. There is a lot of opinion about how good or how bad each item is and what people expect from this line of products but I would like to just briefly touch on one specific element, the icons and logos of Windows 8 and Office 2013. Possibly it is just me but there is a small detail that bugs me with these and I think it shows the importance of the attention to detail that designers need to have. When the Windows 8 logo was first unveiled there was a lot of response both positive and negative some thought it was too bold of a change some loved that it was a nod back to the original logo of Windows 1.0 (The Verge: Windows Logo), as well as referencing the metro interface. With time it seems to have settled in quite well, and I think it is a very strong, self sufficient logo that has a lot of longevity to it. However on the subject of perspective I think they could have improved the logo. The way it currently sits, there are two visual planes, one that the outer square sits on and one that the dividing spaces sit on, the result is, I feel, a visual confusion. The outside frame of the logo is definitely in perspective from the outside edge’s vanishing point to the right hand side being wider than the left. The crossbars however are flat and although it is very subtile it think it should be adjusted so that they are on the same plane sharing the same vanishing point. this results in a very subtle change that is very difficult to tell the difference but I feel sits better and dosn’t give me a nagging uncomfortable feeling when I look at it. But does it matter? its a tiny change, who really cares? Will it make a difference in the long run? I understand it’s small and it really in the long run might not matter, but how about consistency? 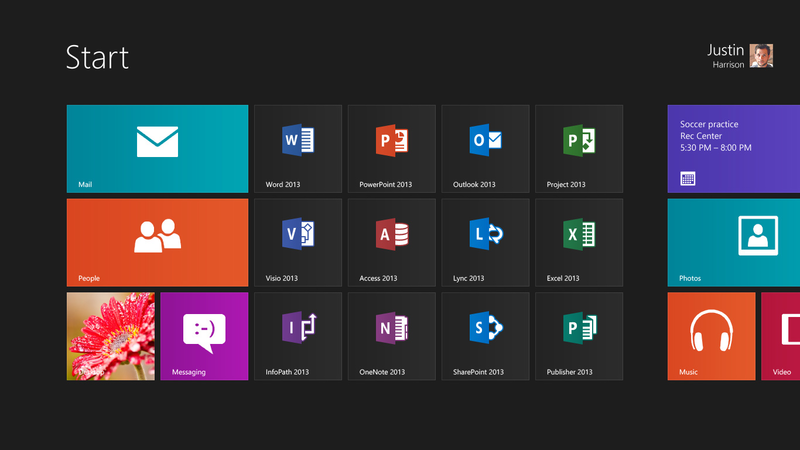 Lets have a look at the new Office 2013 icons, It looks like they missed the boat as well. Below are the Office 2013 icons, they manage to make the same mistake. The letters are on a visual plane but the vanishing point is different of that of the the cover that they reside upon, alienating them from the rest of the icon. As to the actual design of the logos, I like them, I think they go well together and will meld really well with the metro interface that Microsoft is pushing. That being said I have a gripe, the single character and the image is not enough to go with if you are not familiar with the product suite. In these icons three of them contain a “P” and the color difference between Project and Publisher is so subtile I think I would find myself confusing them. Its the little details that can make or break something especially design. i will attempt to reserve judgment until the products actually ship and we see what the finalized look is, but I hope Microsoft tweaks these to give them a more solid feel. Below is a link to a very well thought out rebranding of Microsoft, it is conceived and implemented very well. I think it is a little drastic in its deviation but that’s part of the fun of a project like this. Definitely worth a read if you haven’t already.